If you are going to invest in a kitchen remodel, why not make sure that what you are creating not only fulfills the visual aesthetic you’re looking for, but also helps you cook and bake at your best? This is where custom-built cabinets for your kitchen can really shine. Do You Spend a Lot of Time Cooking and Baking? One of the best things you can do you for yourself in your kitchen is to design spaces for items you use on a consistent basis. You not only want to consider where to house your tools and small appliances, but also how you access them. For instance, if you are a baker and love to use your stand mixer, do what a recent client of ours did: Create a built-in solution that allows you to easily access your mixer. An added bonus: build plug-ins where you need them so you don’t have to worry about moving your items around the kitchen to make space. Do You Hate Wasted Space? The glory of custom cabinets is that you no longer need to deal with wasted space. 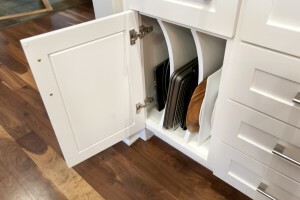 You can work with your designer and cabinet maker to create unique storage solutions to fill every nook and cranny. We offer you this example here: a small corner space turned into useful drawers where you can hide Tupperware, smaller bowls, utensils and anything else you can fit! Do You Lose Items in Your Cupboards Because You Just Can’t See Them? 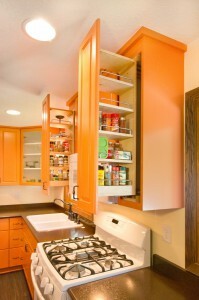 Deep cupboards are fantastic, as they allow you to store more items out of sight. Unfortunately, out of sight truly is out of mind if your cupboards are so deep you can’t see to the back. By incorporating pull-out shelves into your custom kitchen cabinets, you no longer have to worry about lost or misplaced items. Do You Prefer Having a Place for Everything? Then put everything in its place! Identify for your kitchen cabinet designer and maker all the unique (or not so unique) storage issues you have. For example, is there a smart way for you to house your spices? What about using that corner space for a tall, thin cabinet that allows for storing cutting boards and cookie sheets? 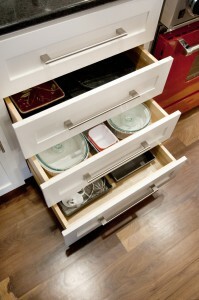 Or perhaps you can create drawers that allow you to safely store pots, pans and lids. When It’s Time for Your Kitchen Remodel, Design It Right! A kitchen remodel is the perfect time to really think about how you want to use your kitchen, not just how you want it to look. 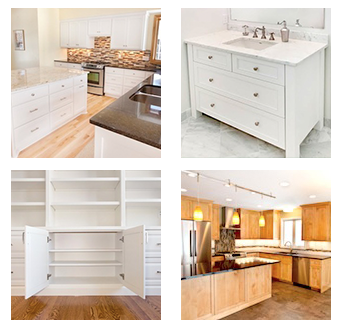 If function and form matter to you, then give our Minneapolis cabinet company a call at 952-737-7088. You can also send over an email inquiry. We will set a time to discuss your kitchen storage needs and get to work on a design you’ll be sure to love.